The September launch of Jio, the long-awaited 4G phone service of oil and gas giant Reliance Industries, unleashed a price war in India’s hyper-competitive telecom market with an offer of a four-month free trial followed by free voice calls and messaging and low-priced data services. Stocks of incumbents, including telecom pioneer Sunil Mittal’s Bharti Airtel, tumbled. Mittal, who founded his Singtelbacked company 21 years ago, has the most to lose; one in four Indians with a mobile phone is an Airtel customer. To fight off the fearsome competitor, Mittal bought 4G spectrum from struggling rivals for $1.2 billion and is gearing up to buy more at a government auction. Reliance chairman Mukesh Ambani, who wants to sign up 100 million customers in short order, accused Airtel and others of blocking Jio’s calls to their networks during the trial phase. Airtel said it had always provided access to Jio and increased the interconnection points to its network after Jio’s commercial launch. The standoff notwithstanding, both are better off this year. While Mittal’s wealth rose on new information about his private assets, Ambani retained the No. 1 spot for the ninth consecutive year on a 21% rise in Reliance’s shares in the past 12 months. The government’s infrastructure push and housing-for-all policy boosted cement and paint fortunes. Soaring shares of his Shree Cement propelled Benu Gopal Bangur into the top 20 for the first time. He and Ashwin Dani of Asian Paints were among 15 people who added more than $1 billion to their wealth. With the entry price to the top 100 at a record $1.25 billion, there are only 6 newcomers this year. The youngest are serial entrepreneurs Bhavin (36) and Divyank (34) Turakhia, who sold their ad tech firm Media.net for $900 million in August. Another new face is Acharya Balkrishna, who cofounded consumer-goods maker Patanjali Ayurved with his friend, yoga guru Baba Ramdev. Two-wheeler tycoon Pawan Munjal takes the spot of his father, Brijmohan Lal Munjal, who died last November. Eight returned to the ranks after their companies outperformed the stock market’s 12% rise in the past year, including biotech pioneer Kiran Mazumdar-Shaw, India’s richest self-made woman. Efforts to revive Suzlon by founder and former billionaire Tulsi Tanti have yet to restore his place in the roster. The 13 who dropped off include not only textile figure Balkrishan Goenka but also pals Sachin Bansal and Binny Bansal, cofounders of Flipkart, amid uncertainty about the e-commerce giant’s valuation. This list was compiled using shareholding and financial information obtained from the families and individuals, stock exchanges, analysts and India’s regulatory agencies. 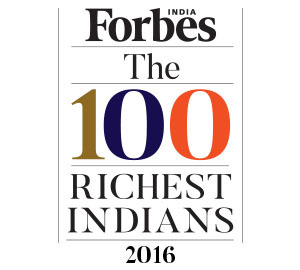 The ranking lists family fortunes, including those shared among extended families such as the Godrej and Bajaj families. Public fortunes were calculated based on stock prices and exchange rates as of September 9. Private companies were valued based on similar companies that are publicly traded.